High traffic areas - Not recommended for gyms. 1/4"
Very durable rubber for commercial and home gyms. 3/8"
Ultra durable rubber designed for extreme use. 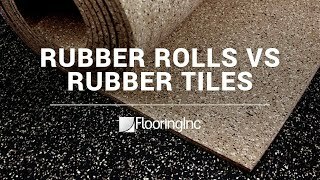 We offer the highest quality, top of the line rubber flooring rolls with the best prices on the market. Our rolled rubber gym flooring is available in plain black, as well as dozens of color flec and designer options. 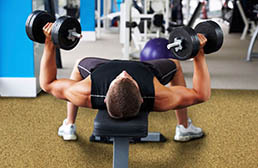 On Rubber Flooring Inc, you will find the best warranties on rubber gym rolls with the fastest lead times on the net. Create your perfect home or commercial gym with a strong, resilient and shock absorbent rolled rubber flooring foundation to set the tone for your function and stylish fitness studio. With both custom cut and pre cut options, you are sure to find the perfect rubber roll for you. Congratulations! You are taking the first steps to improving your very own home or commercial gym. On behalf of RubberFlooringInc, we want to congratulate you and welcome you to the world of rubber flooring. Rolled rubber is a great way to amp up your new or current space. Gym flooring rolls can cover a large or small space without the extra installation time. Rubber rolls are USA made, backed with a 5 year manufacturer warranty. 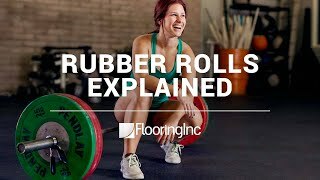 Now you may ask yourself, “Where do I start and what kind of rubber gym rolls are out there?” Don’t fear, we can provide you with all the information you need to get started and, by the end of this, you will feel like you're the flooring expert yourself! Let’s take a look. When it comes to durability and longevity, custom cut and pre cut rubber flooring rolls are perfect for both home and commercial gyms. The difference between the two products is cost and lead time. Custom cut rolls can be cut at 4’ ft wide and min. of 15’ ft in length, they take longer to produce and and cost more. Compared to the pre cut rolls which are pre cut at 4’ ft wide and typically cut at 25’ ft or 50’ ft length. Pre Cut rolls have a shorter lead time, which makes it suitable for customers in a time crunch, and you get more bang for your buck. Thinking about turning that empty room in your home to a personal Gold’s Gym or maybe a yoga/pilates studio. The choices are endless and rubber floor rolls are a great choice for your home gym, giving you a comfortable, durable and budget-friendly gym flooring solution. You just need the right rubber to complement your style. On a budget, but need a durable material? Our Regrind Rubber Gym Rolls are a great product to use for both basic home gym and commercial gyms as well. These rubber gym floor rolls are available in ¼”, 8mm or ?” thicknesses. These rubber gym rolls comes in either a fun, vibrant rainbow confetti color or you can go with basic black with white color fleck. This rolled rubber flooring is available in pre cut sizes of 4’x25’ and 4’x50’. What makes the Regrind Roll so special? The Regrind Rolls are made up of scraps of previous standard rubber flooring rolls and compressed to a create new roll. This rubber gym flooring roll is great for CrossFit, personal training studios and so much more. Eco Flec Rubber Rolls are ideal for people who are turning their personal space into a workout hideaway, the choice is yours. This rolled rubber flooring is less dense, but still provides that little kick of shock absorbency necessary for basic home gyms or light use commercial gyms. 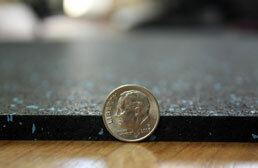 This rolled rubber flooring is available in ?”, ¼”, 8mm, ?” and ½” thicknesses. Eco Flec rolls are pre cut at 4’x25’ or 4’x50’. 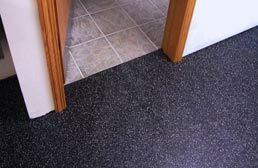 This discount rubber flooring is another perfect option for our budget friendly clients. 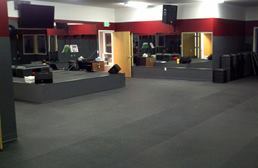 Opening a new fitness gym is an amazing accomplishment and RubberFlooringInc offers a variety of commercial gym flooring options that will add to your new accomplishment with a bit of pizzaz. 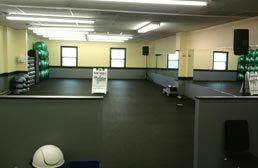 From CrossFit to bodyweight exercise, we provided the best rubber flooring rolls for your commercial gym. We offer different thickness and color options that make it easier for you to put your personal taste into your future gym. We promise you won’t feel overwhelmed; this will assist with narrowing down the exact rubber roll that is suitable for you. We have select rubber flooring rolls that are available in our designer series. And yes, we think it sounds fancy too. These rolls are fancy, as they come in more vibrant and eye-popping colors that will make your commerical gym the talk of the town. Designer Series Rubber Rolls are available in 8mm and 15mm thicknesses, in several sharp, stand-out color options. This rolled rubber flooring is anything but boring. Due to the high quantity of color fleck in the rubber flooring these rubber flooring rolls are a little higher in cost, but definitely worth it with great shock absorbency, high density and beautiful color options, -you can’t beat that! Our high impact rolls and rolled rubber mats are a great material for customers who are doing P90x, Insanity and TRX exercise fan for your home gym. High impact rubber floor rolls are the ideal product for you! These rubber floor rolls provide just the right amount of shock absorbency and anti-fatigue functionality to provide maximum comfort on your joints while you work your heart out. These rolls are available in ?” and ½” thicknesses, making them ideal for high impact, plyometric workouts. **Note: During certain types of running and workouts with significant lateral movements, our Impact Rolls may start to break down and flake over time, creating a flooring surface that is not ideal. For these types of exercises, we recommend the use of our standard rolls, which are more durable and better suited for these types of exercises. Want the wood appearance with a bit of rubber for durability? 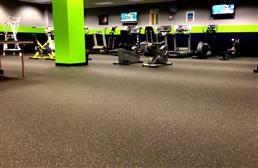 The Impact Wood Series Rubber Rolls combine both materials into one perfect gym flooring roll. These flooring rolls have a 2mm virgin vinyl covering 5mm recycled rubber underlayment. An awesome characteristic of this particular rolled rubber flooring is that it provides the same amount of anti-fatigue and resilience as the impact rolls. These rubber gym rolls are available in one standard size of 6’x25’ at 7mm thick. These rolls feel great on the body, making them perfect for yoga, pilates or even zumba. Our Impact Wood Series Rubber Roll are nonporous and mold/mildew resistant, which is perfect in a place with exposure to moisture. Now rubber floor rolls are not made solely for gym flooring purposes. On the contrary, you can use rubber floor rolls for anything you set your mind to. We have two other types of rubber flooring rolls that may be suitable for your creative space. We also provide you with a better idea of all the different ways you can use these rolls. Take a look below and see what best describes your unique space. Want a great two for one deal? Cork Rubber Rolls are a wonderful way to combine the cushion and comfort of cork flooring with the durability and slip resistance of rubber. These rolls are available in 6mm, 8mm and 9mmthickness. 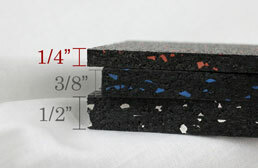 Cork rubber comes custom cut and can be cut at a minimum of 15’ long. With many unique color options, from black to avocado, these rolls are the true beauty of rubber flooring. 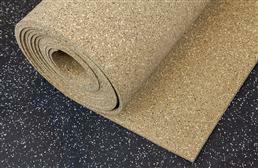 A great rubber roll for home gym flooring, as flooring in basements, locker room flooring, flooring for retail areas, as a protective wall covering, these cork rolls are truly versatile and can used whatever your heart desires.